In a world where we’re clearly not getting enough Star Wars games, you can always count on the fans to deliver. 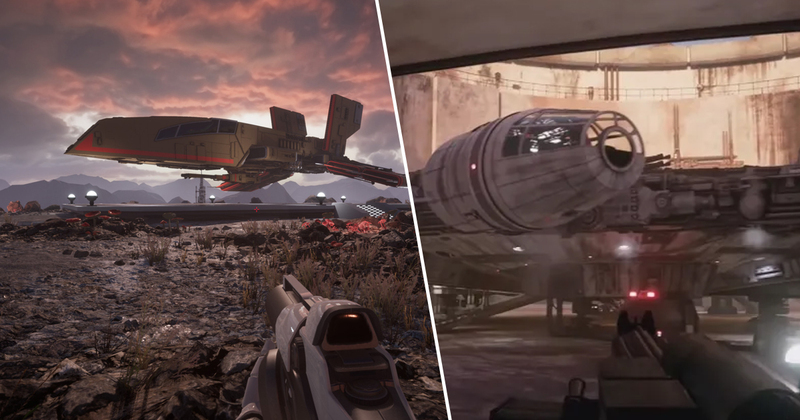 Just a few days after I wrote up a piece on a gorgeous looking Unreal Engine 4 remake of Star Wars Episode I: Racer, it now looks like another classic is getting the same treatment. Star Wars: Dark Forces was a wonderful FPS developed and published by LucasArts back in 1995. Obviously it hasn’t aged all that well visually, but you can’t hold that against a game that released nearly 25 years ago. The Star Wars community being what it is, however, a faithful (and gorgeous) Unreal Engine 4 recreation of Dark Forces is now in the works, and a developer from Obsidian is even involved. The Dark Forces demo video was discovered by YouTuber by YouTuber BlueDrake42, and allows players to run around the famous Mos Eisley on Tatooine. You know, the place where Han shot first and Obi Wan violently dismembered an alien. Going off of the footage (which you can see below) the game really is looking stunning. Like, AAA production levels of stunning. I know that just because something has been done in Unreal Engine doesn’t automatically mean it looks good, but the level of care and detail that’s gone into this is worlds apart from most fan projects. The demo doesn’t have any actual combat in it – or any action at all for that matter, but it’s a great first look at a project that has a ton of promise. Provided Disney don’t shut it down, of course. You can find more gorgeous screenshots and info on the game via Obsidian’s Senior Environment Artist Jason Lewis, who is actually leading the project. If that’s not a mark of this project’s quality, I don’t know what is.